Ordinarily, if your bones were all bright and neon colored, we'd recommend putting a visit to the doctor's office somewhere on your daily To-Do List. It's probably nothing, but flashy multicolored bones just seem like something to get checked out. Although, it could also mean someone is funky and punky to the bone, in which case they don't need to go see a doc; they need to get to a dance floor! If your little rocker is just too cool for boring old non-colorful bones, the best treatment (besides dancing and being awesome, under a doctor's orders) is to set them up with this Funky Punky Bones Costume! It's so effective because they can show both their funky and punky sides, which can be tricky to show off at the same time. This wild look is also a stylish way to look a little bit spooky, but also look way too much fun to be all that scary. 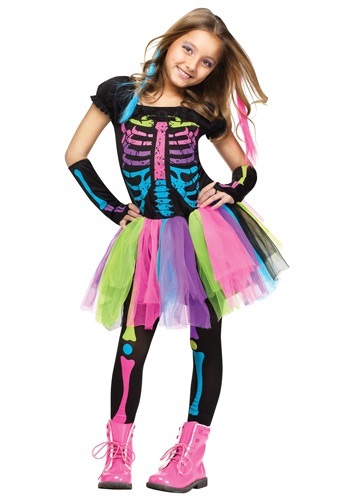 After all, who wouldn't want to party with a psychedelic skeleton-ista, especially one with such groovy colors?? The coolest thing about this outfit, though, is all the different occasions your funky gal can wear it to! We're not talkin' about just Halloween anymore; we're talkin' school costume parties, birthdays, laser-bowling and roller disco parties, any place where she wants to look super cool and chic at the same time. She can add any number of brightly colored accessories to go with this style, from neon wigs and bracelets, to some rockin' boots! No matter how she wears this dazzling ensemble, it's gonna be wicked!